Gleneagles is GOLF! 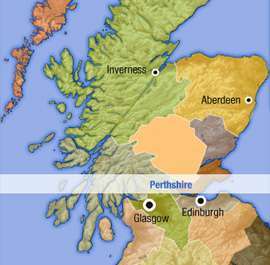 Home to three of the top Scottish Championship Golf Courses, situated near Auchterarder, between Perth and Stirling. A range of other country pursuits and leisure activities are available in the area but golf is the number one attraction here in this region. Although the most famous golf hotels is the Gleneagles hotel, there are also many fine establishments to choose from. You will find Cromlix House Hotel, Duchally Country Estate and The Stakis Cairn Lodge Hotel worthy winners of their luxury country hotel in Perthshire titles. Guests will be able to leave their car behind and walk to Tillicoultry to the cafés, pubs, eating places and shops, or out into the countryside. For some retail therapy, and only a 10-minute walk, the shopping outlet centre, Sterling Mills, has a large selection of stores. This is a great spot for guests who enjoy walking and cycling with established walks and cycle paths that lead through the village, alongside the River Devon and out into the rolling countryside and hills. For more strenuous walks, the Ochil Hills make a good challenging hill walk with super views and peaks over 2000 feet, including Kings Seat, Dumyat and Ben Cleuch. There is a regular bus service to the surrounding villages and Stirling city centre. For days out, Stirling is well worth a visit, and is rich in history with historic monuments including Stirling Castle, Wallace Monument and The Bannockburn Centre. For those wanting to travel a little further afield, the Loch Lomond and Trossachs National Park, Falkirk Wheel and the 30 metre high ’Kelpies’ horse sculptures can all be reached within an hour’s drive. The vibrant city of Edinburgh can also be easily reached from here. Beach 26 miles. Shop and takeaway 200 yards, farm cafe 400 yards and restaurant 500 yards. Important to mention that near Dollar there is a new attraction called the Japanese garden a must for all. Wimbledon champion Andy Murray is returning to his roots with a new luxury hotel venture near his home town in Perthshire, Scotland. The hotel, on an expansive Scottish woodland estate, is currently undergoing refurbishment and will reopen on 1st April 2014 in time for the nearby Ryder Cup in September 2014. A five-star facility with ten spacious bedrooms and five suites, the hotel will also include a private chapel, several function rooms, restaurant run by Albert Roux OBE, KFO and, of course, a tennis court and practice wall. Cromlix is a fine country estate situated in lovely countryside surrounded by its own woodland and fields. For cosy nights in there are also open log fires. The front gates lead to a driveway lined with mature trees which sweeps through parkland to the hotel. The character of the country house will very much be retained but with a slight modern twist. From either Edinburgh or Glasgow the motorways merge onto the M9 heading for Stirling/Perth, it bypasses Stirling and Dunblane (A9 heading for Perth). Take the turn-off signposted Dunblane/Kinbuck on the B8033. Turn right at the junction for Kinbuck. Follow the road through the village, continue over the bridge, our entrance gates are 100 yards on the left. From Inverness, follow the A9 to Perth (south). From Perth take the A9 Stirling road, you will pass a Little Chef then take the next exit signposted Dunblane/Kinbuck on B8033. At the T junction turn right for Kinbuck and follow as above. From Fort William take the A85 heading to Lochearnhead. Then take the A84 to Callander. From Callander follow signs to Doune/Dunblane. In Doune, turn left signposted to Perth which brings you to the dual carriageway. Continue for about 2 miles and take the first exit on the left signposted Dunblane/Kinbuck on the B8033. Turn right at the T junction for Kinbuck, follow the road through the village and continue over the small bridge. Our entrance gates are second on the left. Take the M9 from Edinburgh or the M80 from Glasgow to the Bannockburn roundabout (exit 9) just outside Stirling. From there follow signs for the A91 to St Andrew’s. On reaching Menstrie (about 7 miles from the Bannockburn roundabout), Broomhall Castle sits on the hillside to the left of the main street at the far end of the village.